I cannot pay my Mr Lender loan. What should I do? When you applied for your Mr Lender loan, you had to specify a loan repayment date. If for whatever reason you now find yourself in a position where you cannot repay your loan on time, you have a couple of options to consider. Firstly you should contact Mr Lender and clearly explain why you are not be able to pay back your loan on time. Mr Lender will expect you to tell them when you will be able to pay back your loan. You will need to reassure Mr Lender that you are going to do everything you can to pay back your loan as quickly as possible. 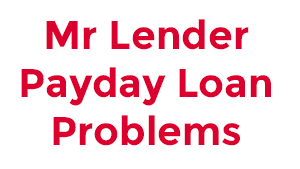 Mr Lender may offer you the option to repay your loan in a number of smaller payment instalments that are more in line with your current affordability and circumstances. Mr Lender will likely ask you to provide income and expenditure information to ascertain what payment instalment you can afford to commit to. If you are unable to repay your Mr Lender loan on time because of a serious change in your financial circumstances, for example losing your job, you will probably need to get assistance from a specialist Debt Help Organisation. Remember, lenders will try to accommodate you up to a point, but they will only accept a relatively small variation from your initial credit agreement. If you have been unfortunate enough to have suffered a serious change in your financial circumstances, it is highly unlikely that you will be able to afford a payment plan, that is in any way close to the terms of your initial credit agreement and therefore you will probably not be able to come to an arrangement with Mr Lender. If you have missed your payment date Mr Lender will try to contact you. Many people choose to ignore the attempts by their lender to contact them once they have defaulted. This is not a good idea. If Mr Lender feels you are trying to avoid repaying your loan, they will most likely proceed with legal action much faster than if you were open, honest and communicated with them. In summary, you have two options. (1) Communicate with Mr Lender, explain your problem and how you are plan to deal with it. (2) If you are really struggling, then get in contact with “Flexible Debt Solutions” and let them help you manage your debts. If you are dissatisfied with the service your have received from Mr Lender then you should contact them at complaints@mrlender.co.uk. Should you wish to speak to Mr Lender you may do so by calling 0208-532-5022 and requesting to speak to the customer service team. Alternatively you may write to Mr Lender at the following address: PDL Finance Limited t/a Mr Lender, Suite 105W, Sterling House, Langston Road, Loughton, IG10 3TS. Should you raise your complaint with Mr Lender over the telephone they say they will make every effort to resolve the matter whilst speaking with you. If you remain dissatisfied with the outcome they will undertake to investigate the matter further and provide you with a written response. Do you want to setup a Debt Management plan? You can setup a debt management plan to take care of your Mr Lender loan and other debts by getting help from this debt management company.